The super stylish celebrity stylist and reality star Rachel Zoe always dressing her Hollywood star clients in famous designers like Marc Jacobs, Michael Kors to Vera Wang. With her very own unique style, her looks has been copied and emulated by many fashionistas. In the September 2010 issue of Harper's Bazaar, Rachel Zoe is in a stunning spread that features her with some seriously sought-after American designers. Harper's Bazaar cleverly using the common use phrase that Rachel always use whenever she saw something super fabulous "I Die! " and Fusing fashion and fantasy, images depict what would actually happen if the stylist to the stars really did "die" for fashion with the designers themselves going in for the kill! 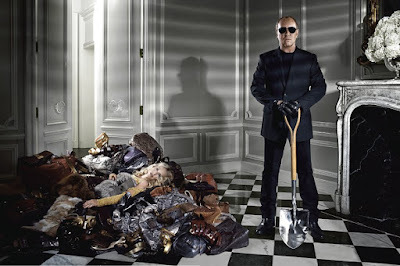 Michael Kors syas to the magazine: " The perfect accessory can make the difference between looking blah and totally to die for"
Vera Wang tells the magazine: "I only want to kill Rachel when I don’t land one of her fabulous clients for the Oscars!" Marc Jacobs says to the magazine: "Rachel’s energy is electrifying…and often shocking! " Here is a video of behind the scene of this fabulous photoshoots! You can check out more to-die-for photos below or go to HarpersBazaar.com for the entire story.